Order the rug off overstock. Looks better in than the picture. Love it. Deep colors and soft matte rug. Very nice rug. Good quality, nice colors. After ordering, I was worried it might be too bright for my family room, but the colors are rich but not overly bold. It's traditional, but not old fashioned. I like that it's wool, and I feel it is a good value. I've been enjoying this rug now for several months, and I'm as pleased with it today as the day it arrived. It's beautiful, with rich colors, and great quality. I haven't experienced any shedding issues, even though it's a pretty thick rug. I thought I might have to put it on a rug pad, but I've just got it on our tiles with my dining table on top and I've not even had any shifting. 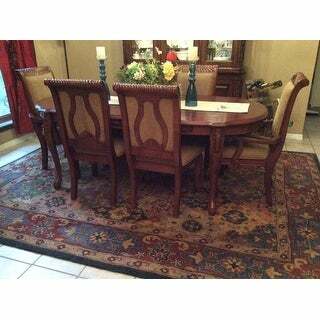 This is an excellent rug at a very good price!! This is a nice rug but the colors are slightly different that what is shown. The outside edge is a medium blue and the blue colors in the interior design area stand out more than the picture shows. It's still a nice rug, just a little different in color than what is shown. The colors on this photo do this rug no justice. It’s so beautiful in person! It’s navy blue, pink, burgundy, gold, periwinkle, & etc. The only bad thing about this rug is it sheds really bad when you vacuum it. It’s wool, and it has a lot of lint. If you can empty your vacuum canister you should be fine. I thought it was an excellent buy! Great quality and goes really nicely in the dining room. The only thing is that this rug has some blue in it and that wasn't mentioned on the description. Would definitely recommend overstock and this rug to a friend. This is a beautiful area rug. It arrived this afternoon. The colors are vibrant, but still not too bold. It looks great in my living room. Using a pad, it's very comfortable underfoot and rolled out nicely. I was so nervous to purchase a rug online. You just can't touch it or see how the colors really look. But we are thrilled. The rug is beautiful, the colors are vibrant and the thickness and quality of the rug feels like I should have paid much, much more. 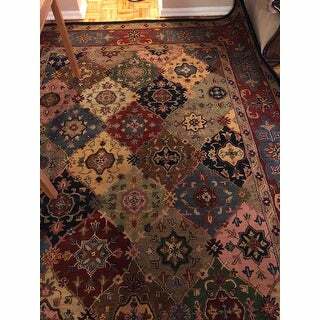 This is a lovely rug; the colors are rich, the pile is thick, and l am delighted with the texture. High quality and beautiful! Definitely recommend it! This rug is beautiful! It sheds little, but it's wool!! No smell at all. It is dark, but works perfectly for me. I love it. The quality of those rugs blew me away. Small price for quality products. Those will suit your decor whether you have a million dollar mansion or just a plain old small home like mine. I just ordered the runner for my hallway. Yes, I would recommend these rugs. 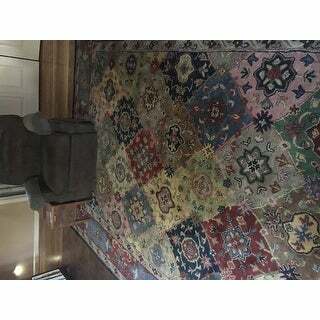 It is a very nice rug and it has a very beautiful pattern and colors. It seems to have be durable and has very fine craftmanship. I think it will last for many years . I would definitely buy this rug again. Nice Color and quality. the order arrive in timely manner and great price. Family love it. I chose this product because I liked the traditional style, the interesting shapes in the design, and the variety of colors. I also like that while there are many colors, the variety is not overwhelming. This rug will add warmth, class, and a sense of timelessness to my living room.